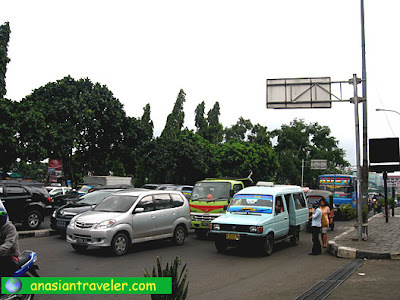 The streets of Jakarta are huge and bustling with people and activity. Roads normally clogged with buses, taxi cabs, motorcycles and private vehicles. 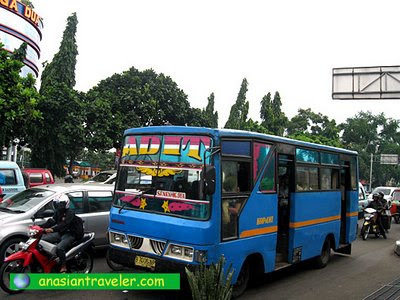 Jakarta has a wide range of public transportation, but during our stay we preferred for the most convenient means of transport - the regular Blue Bird Metered Taxis. This taxi is under Blue Bird Group known for their reliability, efficiency and safety reason. This car has a blue color with flying BIRD logo. However, not all taxi with blue color is Blue Bird. So be careful. Please check if there's a "Blue Bird Group" windscreen sticker and if the driver is wearing a blue color uniform. Pusaka group is one of the subsidiary companies in the Blue Bird group with similar blue color. Other option is the executive Silver Bird taxi, under the same management with Blue Bird but the fare is a bit more expensive though. You can recognize these stylish saloon taxi cars easily as they are painted in shades of black. Pre-booking is recommended. We also happened to see a Bajaj (pronounced "bahdge-eye") or mini car on the road. 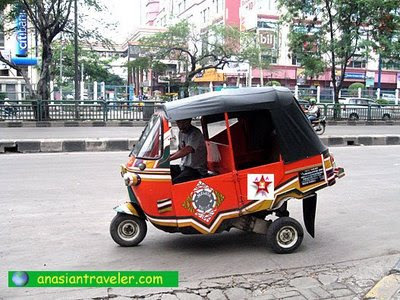 These are motorized three-wheeler tricycles with a cabin for two passengers. 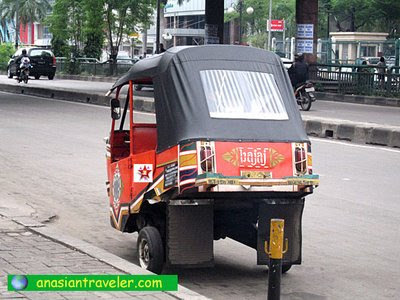 Bajaj looks a bit like the four-wheeled Tuk-Tuk in Bangkok and similar to our Tricycles here in Manila. This trike is recommended only for short distance trip. 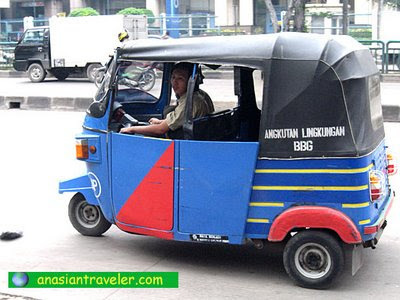 I really can't guarantee you if this is safe or not as we never really got the chance to try the bajaj vehicle. We have read so much about Jakarta's interminable traffic jams, and therefore we were expecting the worst-case scenario. But fortunately, we had never experienced such terrible traffic condition. Although streets were constantly crowded, traffic always appeared to be moderate. You guessed it right. Plus the vehicle is belching out clouds of smokes onto city streets. Those Bajaj are really cute! I love travelling in Asia, but there is still so much to see... Great blog here! Thank you for visiting mine. Looks like Jakarta has so many things similar to our Manila.